The OFCE’s forecast for the French economy in 2015-2016 is now available. Not since the beginning of the subprime crisis has the French economy been in such a favourable situation for a recovery. The fall in oil prices, the ECB’s proactive and innovative policy, the easing of fiscal consolidation in France and the euro zone, the gathering impact of the CICE tax and the implementation of the Responsibility Pact (representing a tax transfer to business of 23 billion euros in 2015 and nearly 33 billion in 2016) all point in the same direction. The main obstacles that have held back French activity over the last four years (over-calibrated fiscal austerity, a strong euro, tight financial conditions, and high oil prices) should all be out of the way in 2015 and 2016, with pent-up growth finally released. The supply policy being pushed by the government, whose impact on business is still pending, will be all the more effective thanks to the positive demand shock from foreign trade, which will allow the economic rebalancing that was lacking up to now. 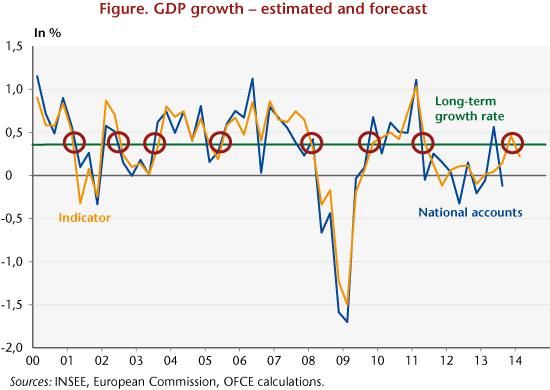 French GDP will grow by 1.4% in 2015, with the pace accelerating in the course of the year (to 2% yoy). The second half of 2015 will mark the turning point in the recovery, with the corporate investment rate picking up and the unemployment rate beginning to fall, ending the year at 9.8% (after 10% in late 2014). 2016 will then be the year of recovery, with GDP growth of 2.1%, a 4% increase in productive investment and the creation of nearly 200,000 private sector jobs, pushing the unemployment rate down to 9 5% by end 2016. In this positive context, the public deficit will fall significantly, and is expected to be 3.1% of GDP in 2016 (after 3.7% in 2015). Obviously this virtuous cycle will only take effect if the macroeconomic environment remains favourable (low oil prices, a competitive euro, no new financial tensions in the euro zone, etc.) and if the government limits itself to the budget savings already announced. This text draws on the article “Le piège de la déflation: perspectives 2014-2015 pour l’économie mondiale” [The deflation trap: the 2014-2015 outlook for the world economy], written by Céline Antonin, Christophe Blot, Amel Falah, Sabine Le Bayon, Hervé Péléraux, Christine Rifflart and Xavier Timbeau. Does growth in the euro zone really depend on a hypothetical German fiscal stimulus? Revising the budget in Croatia: yes, but … for whom and why? According to the OFCE’s leading indicator, the French economy has grown by 0.5% in the fourth quarter of 2013. This result, which was anticipated, reflects the improvement in business surveys seen for about a year now. However, does this mark the return of GDP to a path of higher long-term growth? It is still too early to say. The improvement in the business surveys anticipated the interruption in the second recession that took place in the first half of 2011. The national accounts then validated the signal emitted by the surveys, with renewed growth of 0.6% in the second quarter of 2013 (Table). GDP did of course fall again in the third quarter (-0.1%), but on average over the last two quarters there was growth of approximately 0.2% per quarter, a rate that, though very moderate, was still positive. At the same time, the leading indicator, which aims to arrive at an estimate of GDP growth in the very short term by translating the cyclical information contained in the surveys, also pointed to a slow recovery in activity: on average over the last two quarters, growth was estimated at 0.1%, a figure that is slightly under the assessment of the national accounts. In the last few months, the uncontested growth in the confidence of private agents has enhanced the outlook for the end of 2013: the debate is now focusing on the possibility for the French economy to break through a turning point upwards and for growth to settle in at a level higher than the pace of long-term growth (0.35% per quarter). Based on past experience, when the indicator has sent out warning signs of a turning point in the economic cycle, the signal issued for the fourth quarter of 2013 is indicating that the long-term growth rate of the French economy is being crossed (Figure). This signal is fragile: the still very partial information on the first quarter of 2014, i.e. the business surveys for January, point towards the growth rate falling below its potential. The possibility of a real lasting recovery that is able to create jobs and reverse the trend in unemployment is thus still very uncertain. The leading indicator aims to forecast the quarterly growth rate for French GDP two quarters beyond the latest available data. The components of the indicator are selected from survey data sets that are rapidly available and unrevised. The selection of the data series is made on an econometric basis, starting from the business surveys carried out in different productive sectors (industry, construction, services, retail) and among consumers. Two series related to the international environment are also significant: the rate of growth of the real exchange rate of the euro against the dollar, and the real growth rate of oil prices. Some components are at least two quarters in advance and as such can be used to predict GDP growth. Others are coincidental, or are not sufficiently advanced to make a forecast two quarters ahead. These series need to be forecast, but over a short-term horizon that never exceeds four months. The leading indicator is calculated at the beginning of each month, shortly after the publication of the business and consumer surveys. Does financial instability really undermine economic performance? 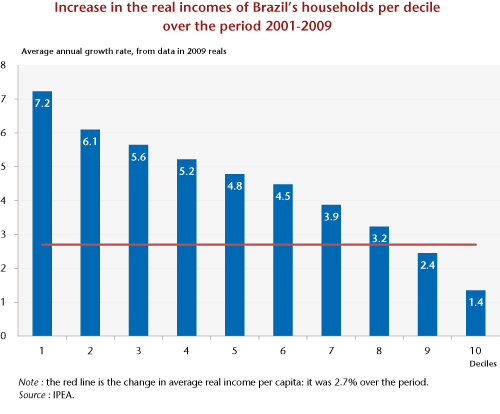 The rise in public transport prices had barely been in force for two weeks when this lit the fire of revolt and led to a new twist in the so-called “Brazilian development model”. With its aspirations for high-quality public services (education, health, transport, etc. ), the new middle class that formed during the last decade is claiming its rights and reminding the government that the money put up to host major sports events (2014 World Cup, 2016 Olympics) should not be spent to the detriment of other priorities, especially when growth has ceased and budget constraints demand savings.